Test cricket is the longest form of the sport of cricket and is considered its highest standard. Test matches are played between national representative teams with "Test status", as determined by the International Cricket Council . The two teams of 11 players play a four-innings match, which may last up to five days . It is generally considered the most complete examination of teams' playing ability and endurance. The name Test stems from the long, gruelling match being a "test" of the relative strengths of the two sides. 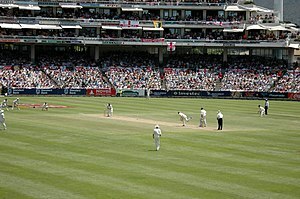 A Test match between South Africa and England in January 2005. The two men wearing black trousers are the umpires. Test cricket is played in traditional white clothes and usually with a red ball - a pink ball in Day/Night Tests. Test cricket is the longest form of the sport of cricket and is considered its highest standard. Test matches are played between national representative teams with "Test status", as determined by the International Cricket Council (ICC). The two teams of 11 players play a four-innings match, which may last up to five days (or longer in some historical cases). It is generally considered the most complete examination of teams' playing ability and endurance. The name Test stems from the long, gruelling match being a "test" of the relative strengths of the two sides. The first officially recognised Test match began on 15 March 1877 and ended on 19 March 1877 and was played between England and Australia at the Melbourne Cricket Ground (MCG), where Australia won by 45 runs. A Test match to celebrate 100 years of Test cricket was held in Melbourne from 12 to 17 March 1977, in which Australia beat England by 45 runs—the same margin as that first Test. In October 2012, the International Cricket Council recast the playing conditions for Test matches, permitting day/night Test matches. The first day/night game took place between Australia and New Zealand at the Adelaide Oval, Adelaide, on 27 November 2015. Find out more at ecb.co.uk Watch the morning session from day 1 of the Lord's 2nd Ashes Test match.